Hong Kong Disneyland is looking for Male and Female Vocalists & Dancers ready for a life-enriching experience in one of the world's most exciting and exotic locales! This will be held on January 15, 2016 (for Vocalists) and January 17, 2016 (for Dancers) at Steps Dance Studio in Makati City. Excellent benefits include roundtrip airfare, medical and dental coverage, paid vacations and sick days, plus a competitive salary and a Magic of Disney! Miss Kitty - The sultry and spirited proprietress of the local saloon in the new gold mining town of Grizzly Gulch. Singer/Actress/Street Performer that moves well. A brassy alto – strong G below middle C to C (possibly a mixed C#). Performers must be at least 18 years of age and willing to relocate to Hong Kong for the duration of their contract. Prepare two 16 bar selections of a song that best showcase your vocal range, and provide clearly marked sheet music in the correct key for the accompanist. Prerecorded accompaniment tracks or a cappella auditions are not allowed. Hong Kong Disneyland is looking for trained Dancers. 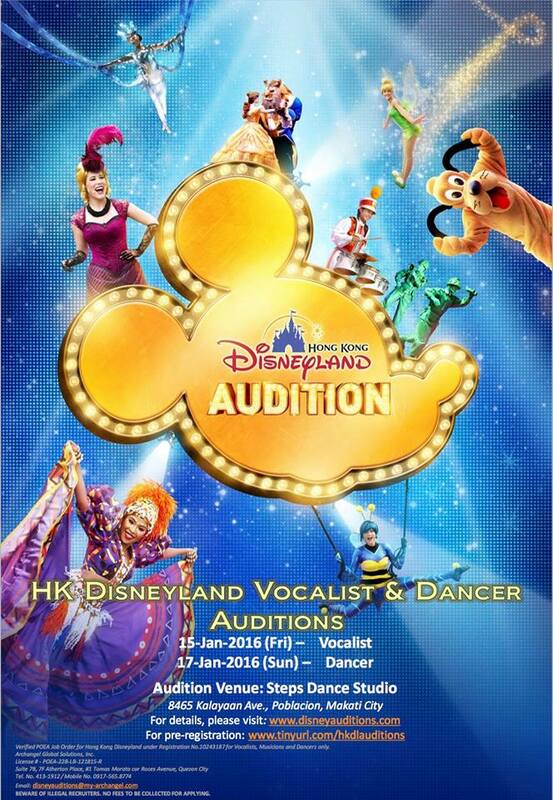 You could have a chance to perform in Hong Kong Disneyland's stage shows, special events, conventions and parades. You may appear both as part of a dance chorus, or as featured soloists. Dancers must be trained dancers with a well-rounded background in Jazz and Ballet. Tumbling and gymnastic ability is a plus, but is not required. Performers must be at least 21 years of age and willing to relocate to Hong Kong for the duration of their contract. Dancers should have a well-rounded background in Jazz and Ballet. Tumbling and gymnastic ability is a plus but not required.